next to El Rio Caroni the morning of the 9 October 1937 Auyántepui flight. Captain Cardona is in the center with Miguel Angel Delgado on the far left. 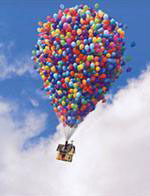 Between 1935 and 1937 Jimmie and Marie Angel made several trips between Venezuela and the United States. During this period, he acquired his beloved Flamingo airplane, registration number NC-9487. He named the airplane El Rio Caroni after the Caroni River which he used as is primary visual navigational guide. The Caroni River flows south to north through the Gran Sabana to join the Orinoco River at Ciudad Guayana east of Ciudad Bolivar. Venezuelan Gustavo “Cabuya” Heny met Jimmie and Marie Angel in Ciudad Bolivar in 1937. Heny was a noted woodsman and explorer. According to Heny's niece Carmen Dearden, he was intrigued by Angel’s reputation as an aviator-explorer and the adventure of the expedition rather than the lure of gold. Jimmie Angel immediately liked Heny and trusted him. The trust was shared and Heny accepted Jimmie’s invitation to join the expedition. 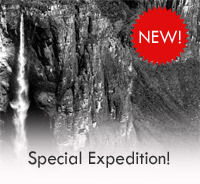 Heny agreed to be the leader of the expedition should they need to abandon El Rio Caroni on Auyántepui. A native of Barcelona, Spain and former officer in the Spanish Merchant Marine, Captain Felix Cardona Puig had explored the Gran Sabana area on foot in search of plants. Angel considered Cardona an expert radioman. His was a skill that would be needed to maintain communications between the group’s base camp and their landing site on Auyántepui. Cardona was interested in Angel’s plan to find the lost river of gold and accepted his invitation to join the expedition. © Heny/JAHPGustavo Heny (left) with Captain Felix Cardona Puig who is packing gear in preparation for searching for a landing site on Auyántepui. 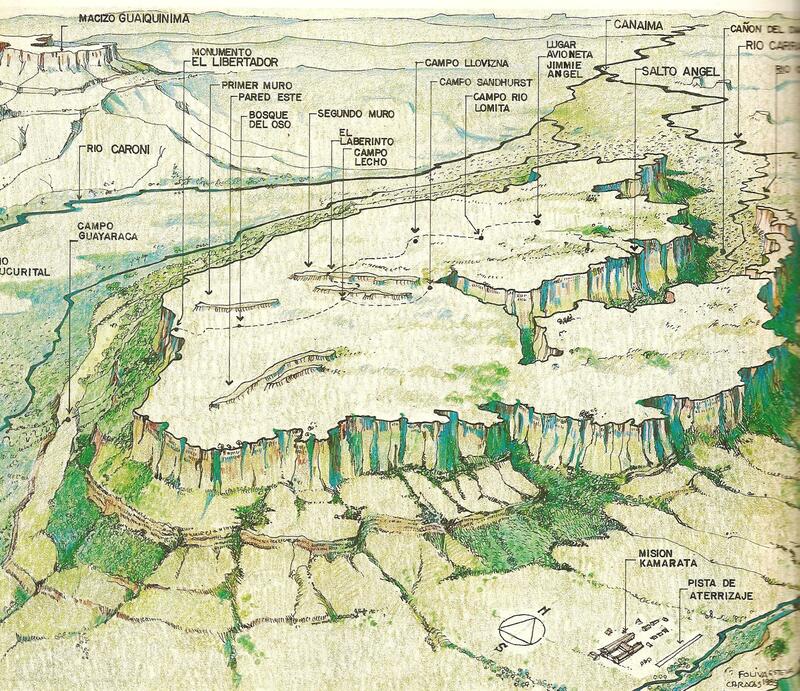 Prior to the landing on Auyántepui, Heny and Cardona attempted to reach the proposed landing site by foot. Their search for a foot route was only partially successful. Cardona became disgruntled and returned to camp after a few days. Heny continued to pursue a route from Camp Angel at Guayaraca on the south side of Auyántepui to the top of the plateau and across the plateau assisted by Miguel Angel Delgado. Unfortunately, they were turned back by the tepui’s great second interior wall before they could reach the place where Angel intended to land. During Heny’s fifteen days of reconnaissance on Auyántepui, Angel dropped supplies from El Rio Caroni that were attached to parachutes that had been fashioned by Heny’s sister Carmen. 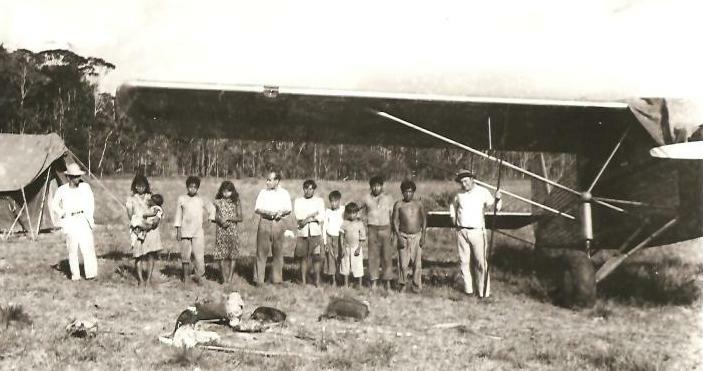 The Auyántepui landing party, which included Jimmie and Marie Angel, Gustavo Heny and Miguel Angel Delgado, was well prepared for possible problems. Their supplies included a tent, eighty meters of rope, and enough food for fifteen days. Heny’s gardener and jungle companion Delgado was admired for his ability with ropes and machetes – valuable skills for their adventure. Pursuing the lost river of gold, Jimmie Angel had scouted the landing spot on Auyántepui from the air prior to the landing attempt on 9 October 1937. 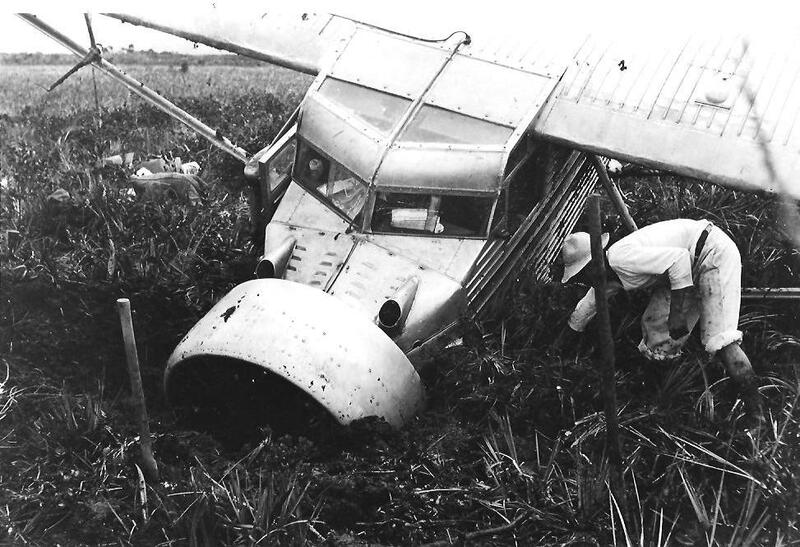 At first, the landing appeared to be perfect, but the wheels of El Rio Caroni broke through the sod and sank into mud bringing the airplane to an abrupt halt with a broken fuel line and its nose buried in the mud. No gold was found. on the lower slopes of Auyántepui. of Venezuela: Native and Cultivated. Gustavo Heny to Enrique Lucca Lineas, April 1970 Translation from Spanish to English by John de Coup-Crank. 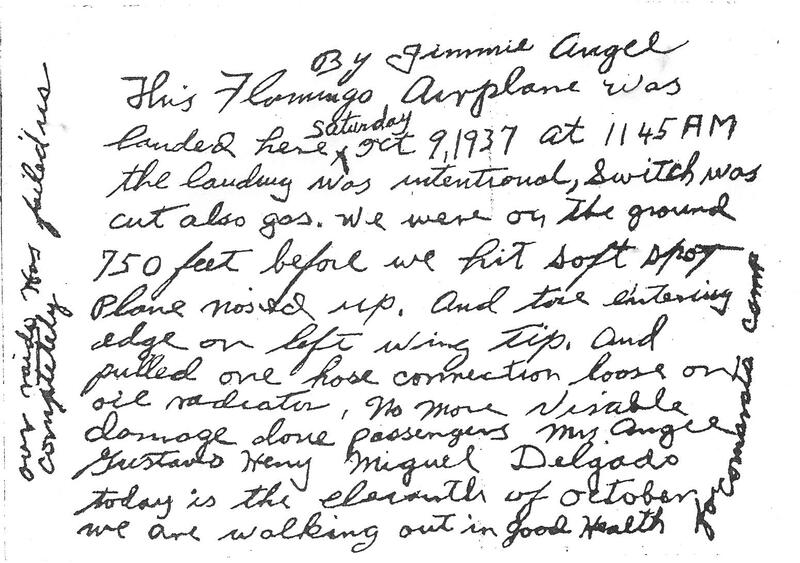 When it became clear that El Rio Caroni was hopelessly mired in her muddy landing spot, Angel wrote a note on 11 October 1937 explaining their landing and departure from the site and left it in the airplane. Prior to starting the long march to Kamarata, cloth was torn to read “ALL OK” and taped to the wing of El Rio Caroni with an arrow showing the direction the group was heading. 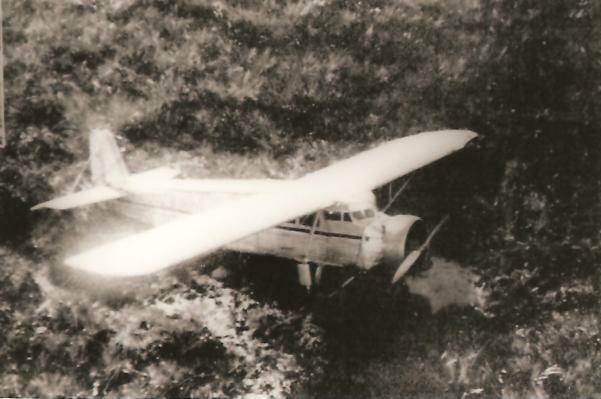 Angel and Heny had expected pilots to come to their assistance, but the search for the landing party was delayed due to loss of radio contact with Cardona at Angel’s Camp at Guayaraca. When Dr. William H. Phelps, Sr., a close friend of Gustavo Heny, did send airplanes to search for them, the rescue pilots could not see them because heavy clouds covered the mountain. Heny, with the assistance of Delgado, saved the landing party from death by leading them to safety on an eleven day retreat from the north side of Auyántepui across the plateau, down the unknown second great interior wall, then to the south rim where they descended the trail that had been blazed by Heny only days before. During their return journey from Auyántepui, Capt. Cardona remained at Camp Angel; radio contact was not maintained with the landing party. Following their safe return to Kamarata, Heny retraced the difficult route alone and retrieved personal possessions from El Rio Caroni. El Rio Caroni was declared a national monument by the government of Venezuela in 1964 (Venezuelan Official Gazette #27533, 3 September 1964). Its silvery form remained on Auyántepui for over 30 years until it was removed by the Venezuelan Air Force in 1970 and taken to the Aviation Museum in Maracay for restoration. A partially restored airplane which includes many components of the original El Rio Caroni was later moved to the airport at Ciudad Bolivar where it remains on the green in front of the passenger terminal. The Flamingo El Rio Caroni was manufactured in 1929 by the Metal Aircraft Corp. at Lunken Airport, Cincinnati, Ohio. There were approximately thirty airplanes manufactured in the Flamingo series. Its welded steel tube framework is covered with aluminum alloy and is subject to corrosion. El Rio Caroni is an important symbol of Venezuelan exploration which requires proper conservation for it to survive the 21st Century. Miguel Angel Delgado  attempting to dig the landing gear of El Rio Caroni out of the muddy  bog. Karen Angel © JAHP 2010. For additional history, references and bibliography, please see Research Papers. to abandon his airplane in an undignified position.